Make a game out of seeing who can carry a load of toys farther without spilling. Easy does it! Made in Europe, entirely out of wood from European forests, the ooh noo Toy Wheelbarrow helps kids develop important gross-motor skills in a complex process that requires strength, coordination, balance and precision. By lifting the handles, balancing the cart on the wheel and pushing it along, a child can engage in developmental and creative play. Its thick rubber tyre even makes it rugged enough to traverse the yard or garden with a load of toys. Not to mention, it’s attractive to both boys and girls. Maximum weight load: 3 kg / 6.6 lbs. Recommended for children 36 months or older. 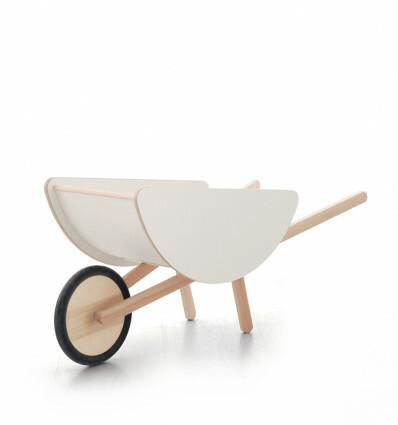 Wipe any dirt from the wheelbarrow with a damp cloth. This will remove grime from general use. Tougher stains like food, crayons, marker or mud may be difficult to remove.